Low back pain is a considerable health problem in all developed countries and is most commonly treated in primary healthcare settings. It is usually defined as pain, muscle tension, or stiffness localised below the costal margin and above the inferior gluteal folds, with or without leg pain (sciatica). The most important symptoms of low back pain are pain and disability.. The human spine is a self-supporting construction of skeleton, cartilage, ligaments and muscles. Erect, there are four sagittal curves, which are the result of man’s evolution from quadruped to biped. The four curves resulted: cervical lordosis, thoracic kyphosis, lumbar lordosis and sacrococcygeal kyphosis. This S form seems to be a compromise between the static and the dynamic qualities of the spine; theoretical considerations suggest that the S form is the shape an elastic bar adopts when it is subjected to axial compression. Each vertebral body is more or less a cylinder with a thin cortical shell, which surrounds cancellous bone. From L1 to L5, the posterior aspect changes from slightly concave to slightly convex, and the diameter of the cylinder increases gradually because of the increasing loads each body has to carry. At the upper and lower surfaces, two distinct areas can be seen: each is a peripheral ring of compact bone – surrounding and slightly above the level of the flat and rough central zone – which originates from the apophysis and fuses with the vertebral body at the age of about 16. The central zone – the bony endplate – shows many perforations, through which blood vessels can reach the disc. A layer of cartilage covers this central zone, which is limited by the peripheral ring. This is the cartilaginous endplate, forming the transition between the cortical bone and the rest of the intervertebral disc. A sagittal cut through the vertebral body shows the endplates to be slightly concave, which consequently gives the disc a convex form. diameter and widens the transverse diameter of the vertebral canal from above downwards. 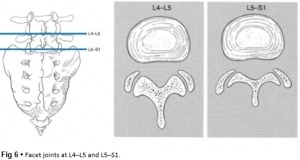 Together with the increasing convexity of the posterior aspect of the vertebral body, these changes in the position of the pedicles alter the shape of the normal bony spinal canal from an ellipse at L1 to a triangle at L3 and more or less a trefoil at L5 (Fig. 1). Each lamina is flat and broad, blending in centrally with the similarly configured spinal process, which projects directly backwards from the lamina. The two transverse processes project laterally and slightly dorsally from the pediculolaminar junction. The superior and inferior articular processes originate directly from the lamina. The part of the lamina between the superior and inferior articular processes is called the ‘pars interlaminaris’. It runs obliquely from the lateral border of the lamina to its upper medial border. This portion of the lamina is subjected to considerable bending forces, as it lies at the junction between the vertically oriented lamina and the horizontally oriented pedicle. This ‘interlaminar part’ will therefore be susceptible to fatigue fractures or stress fractures (spondylolysis). 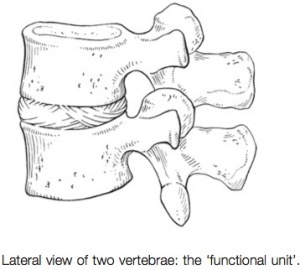 Two adjacent vertebral bodies are linked by an intervertebral disc. Together with the corresponding facet joints, they form the ‘functional unit of Junghans’n (Fig. 2). 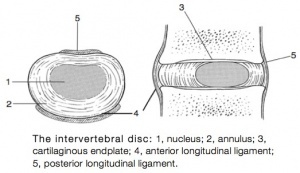 The disc consists of an annulus fibrosus, a nucleus pulposus and two cartilaginous endplates. The distinction between annulus and nucleus can only be made in youth, because the consistency of the disc becomes more uniform in the elderly. For this reason, nuclear disc protrusions are rare after the age of 70. From a clinical point of view, it is important to consider the disc as one integrated unit, the normal function of which depends largely on the integrity of all the elements. That means that damage to one component will create adverse reactions in the others. An upper and a lower cartilaginous endplate (each about 0.6– 1 mm thick) cover the superior and inferior aspects of the disc. They are plates of cartilage that bind the disc to their respective vertebral bodies. Each endplate covers almost the entire surface of the adjacent vertebral body; only a narrow rim of bone, called the ring apophysis, around the perimeter of the vertebral body is left uncovered by cartilage. That portion of the vertebral body to which the cartilaginous endplate is applied is referred to as the vertebral endplate. The endplate covers the nucleus pulposus in its entirety; peripherally it fails to cover the entire extent of the annulus fibrosus. The collagen fibrils of the inner lamellae of the annulus enter the endplate and merge with it, resulting in all aspects of the nucleus being enclosed by a fibrous capsule. The endplate permits diffusion and provides the main source of nutrition for the disc. The hyaline endplate is also the last part of the disc to wear through during severe disc degeneration. two consecutive layers are oriented in opposite directions, they cross each other at an angle of approximately 120°. This arrangement of the annular fibers gives the normal disc great strength against shearing and rotational stresses, while angular movements remain perfectly possible. The outermost fibers are attached directly to bone, around the ring apophysis, and for that reason they are referred to as the ligamentous portion of the annulus fibrosis. The inner third merges with the cartilaginous endplate and is referred to as the capsular portion of the annulus fibrosis (Fig. 4). This consists of a gelatinous substance, made of a meshwork of collagen fibrils suspended in a mucoprotein base, which contains mucopolysaccharides and water. As the anterior part of the vertebral body grows faster than the posterior part, the nucleus comes to lie more posteriorly. Consequently, the anterior part of the annulus will have thicker and stronger fibres, which means that the annulus gives better protection against anterior than posterior displacements of the nucleus; this is disadvantageous with respect to the contiguous nerve roots and dura. The primary function of the disc is to join the vertebrae and allow movement between them. The other functions are typical of the erect spine: a shock absorber; a load distributor; and a separator of the posterior facets to maintain the size of the intervertebral foramen. Several anatomical, biochemical and biomechanical properties make the posterior aspect of the disc the most critical and vulnerable part of the whole intervertebral joint. The posterior annular fibers are sparser and thinner than the anterior. Because the area available for diffusion is smaller posteriorly than anteriorly, the posterior part of the nuclear–annular boundary receives less nutrition and again the posterior part of the disc is the most strained part. The posterior longitudinal ligament affords only weak reinforcement, whereas the anterior fibers are strengthened by the powerful anterior longitudinal ligament. 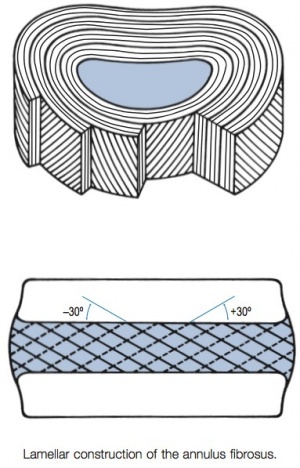 Because of the special mechanical arrangements of the annular fibers, the tangential tensile strain on the posterior annular fibers is 4–5 times the applied external load. All these elements explain the predominance of the posterior part of the disc in the development of weakening, radiating ruptures and posterior nuclear displacements. This is unfortunate, because most nociceptive tissues responsible for backache and sciatica (nerve roots and dura mater) emerge just beyond the posterior aspect of the disc. The joints between the lower and upper articular processes are called zygapophyseal joints, apophyseal joints or ‘facet’ joints. They are true synovial joints, comprised of cartilaginous articular surfaces, synovial fluid, synovial tissue and a joint capsule (Fig. 5). The superior articular surface is slightly concave and faces medially and posteriorly. The convex inferior articular surface points laterally and slightly anteriorly. In general terms, there is a change from a relatively sagittal orientation at L1–L3, to a more coronal orientation at L5 and S1 (Fig. 6). Unlike the disc, the facet joints normally do not bear weight and during normal loads they are not subjected to compression strain. In degenerative fragmentation of the disc, however, intervertebral height diminishes and the articular surfaces are subjected to abnormal loading, setting up spondylarthrosis. The main function of the facet joints is to guide lumbar movements and keep the vertebrae in line during flexion–extension and lateral flexion. Because of the more sagittal slope of the articular surfaces, very little rotation takes place at the four upper lumbar levels. More distally, at the lumbosacral level, the joint line has a more coronal plane, which makes rotational movements potentially possible, but these are limited by the iliolumbar ligaments. The total range of rotation in the lumbar spine is therefore very limited, although not completely zero. 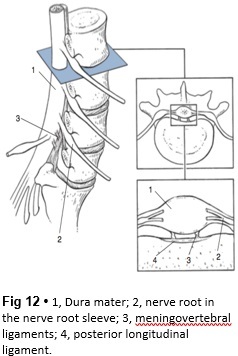 Fibers of the medial branch of the dorsal root innervate the facet joints. 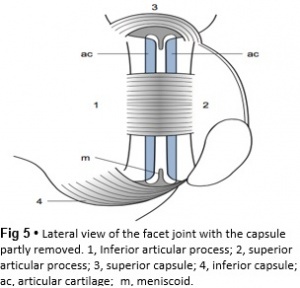 The same nerve supplies the inferior aspect of the capsule and the superior aspect of the joint below. The broad, thick anterior longitudinal ligament (Fig. 7) originates from the anterior and basilar aspect of the occiput and ends at the upper and anterior part of the sacrum. It consists of fibers of different lengths: some extend over 4–5 vertebral bodies; the short fibers attach firmly to the fibers of the outermost annular layers and the periosteum of two adjacent vertebrae. The posterior longitudinal ligament (Fig. 8) is smaller and thinner than its anterior counterpart: 1.4 cm wide (versus 2 cm in the anterior ligament) and 1.3 mm thick (versus 2 mm). The posterior longitudinal ligament is narrow at the level of the vertebral bodies, and gives lateral expansions to the annulus fibrosis at the level of the disc, which bestow on it a denticulated appearance. Although the posterior ligament is rather narrow, it is important in preventing disc protrusion. Its resistance is the main factor in restricting posterior prolapse and accounts for the regular occurrence of spontaneous reduction in lumbago. This characteristic is also exploited in manipulative reduction, when a small central disc displacement is moved anteriorly when the ligament is tightened. The ligamentum flavum (Fig. 9) connects two consecutive laminae and has a very elastic structure with an elastin content of more than 80%. 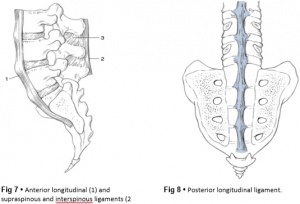 The lateral extensions form the anterior capsule of the facet joints and run further laterally to connect the posterior and inferior borders of the pedicle above with the posterior and superior borders of the pedicle below. These lateral fibers form a portion of the foraminal ring and the lateral recess. The interspinous ligament (Fig.7) lies deeply between two consecutive spinal processes. Unlike the longitudinal ligaments, it is not a continuous fibrous band but consists of loose tissue, with the fibers running obliquely from posterosuperior to anteroinferior. This particular direction may give the ligament a function over a larger range of intervertebral motion than if the fibers were vertical. The ligament is also bifid, which allows the fibers to buckle laterally to both sides when the spinous processes approach each other during extension. The supraspinous ligament is broad, thick and cord-like. It joins the tips of two adjacent spinous processes, and merges with the insertions of the lumbodorsal muscles. Some authors consider the supraspinous ligament as not being a true ligament, as it seems to consist largely of tendinous fibers, derived from the back muscles. The effect of the supraspinous ligaments on the stability of the lumbar spine should not be underestimated. Because the ligament is positioned further away from the axis of rotation and due to its attachments to the thoracolumbar fascia, it will have more effect in resisting flexion than all the other dorsal ligaments. The intertransverse ligaments are thin membraneous structures joining two adjacent transverse processes. They are intimately connected to the deep musculature of the back. Theiliolumbar ligaments (Fig. 9) are thought to be related to the upright posture. They do not exist at birth but develop gradually from the epimysium of the quadratus lumborum muscle in the first decade of life to attain full differentiation only in the second decade. The ligament consists of an anterior and a posterior part. The anterior band of the iliolumbar ligament is a well-developed, broad band. 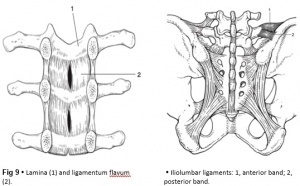 The iliolumbar ligaments play an important role in the stability of the lumbosacral junction by restricting both side flexion and rotational movement at the L5–S1 joint and forward sliding of L5 on the sacrum. The spine is unstable without the support of the muscles that power the trunk and position the spinal segments. Back muscles can be divided in four functional groups: flexors, extensors, lateral flexors and rotators (Fig. 11). The extensors are arranged in three layers: the most superficial is the strong erector spinae or sacrospinalis muscle. Its origin is in the erector spinae aponeurosis, a broad sheet of tendinous fibers attached to the iliac crest, the median and lateral sacral crests and the spinous processes of the sacrum and lumbar spine. The middle layer is the multifidus. The fibers of the multifidus are centered on each of the lumbar spinous processes. From each spinal process, fibers radiate inferiorly to insert on the lamina, one, two or three levels below. The arrangement of the fibers is such that it pulls down- wards on each spinal process, thereby causing the vertebra of origin to extend. The third layer is made up of small muscles arranged from level to level, which not only have an extension function but also are also rotators and lateral flexors. The flexors of the lumbar spine consist of an intrinsic (psoas and iliacus) and an extrinsic group (abdominal wall muscles). Lateral flexors and rotators are the internal and external oblique, the intertransverse and quadratus lumborum muscles. It is important to remember that pure lateral flexion is brought about only by the quadratus lumborum. The spinal canal is made up of the canals of individual vertebrae so that bony segments alternate with intervertebral and articular segments. The shape of the transverse section changes from round at L1 to triangular at L3 and slightly trefoil at L5 (Fig. 1). An anterior wall and a posterior wall, connected through pedicles and intervertebral foramina, form the margins of the canal. The anterior wall consists of the alternating posterior aspects of the vertebral bodies and the annulus of the intervertebral discs. In the midline these structures are covered by the posterior longitudinal ligament, which widens over each intervertebral disc. The posterior wall is formed by the uppermost portions of the laminae and the ligamenta flava. Because the superoinferior dimensions of the laminae tend to decrease at the L4 and L5 levels, the ligamenta flava consequently occupy a greater percentage of the posterior wall at these levels. The spinal canal contains the dural tube, the spinal nerves and the epidural tissue. The dura mater is a thick membranous sac, attached cranially around the greater foramen of the occiput, where its fibers blend with the inner periosteum of the skull, and anchored distally to the dorsal surface of the distal sacrum by the filum terminale. At the lumbar level, the dura contains the distal end of the spinal cord (conus medullaris, ending at L1), the cauda equina and the spinal nerves, all floating and buffered in the cerebrospinal fluid. The lumbar roots have an intra- and extrathecal course. Emerging in pairs from the spinal cord, they pass freely through the subarachnoid space before leaving the dura mater. In their extrathecal course and down to the intervertebral foramen, they remain covered by a dural investment. At the L1 and L2 levels, the nerves exit from the dural sac almost at a right angle and pass across the lower border of the vertebra to reach the intervertebral foramen above the disc. From L2 downwards, the nerves leave the dura slightly more proximally than the foramen through which they will pass, thus having a more and more oblique direction and an increasing length within the spinal canal. The dura mater has two characteristics that are of cardinal clinical importance: mobility and sensitivity. The radicular canal contains the intraspinal extrathecal nerve root. The nerve root consists of a sheath (dural sleeve) and fibres. Each structure has a specific behaviour and function, responsible for typical symptoms and clinical signs. This has some clinical consequences: slight pressure and inflam- mation only involve the sleeve and provoke pain and impaired mobility. More substantial compression of the root will also affect the nerve fibres, which leads to paraesthesia and loss of function. Low back pain is a symptom, not a disease, and has many causes. It is generally described as pain between the costal margin and the gluteal folds. It is extremely common. About 40% of people say that they have had low back pain within the past 6 months. Onset usually begins in the teens to early 40s. A small percentage of low back pain becomes chronic[2,3]. Low back pain is considered acute if its onset occurred less than 1 month ago. The symptoms of chronic low back pain have lasted 2 months or longer. Both acute and chronic low back pain may be further classified as non-specific or specific/radicular. The severity of the complaints depends on the strength of compressive from the hernia on surrounding components. Some conditions can present with similar impairments and should be included in the clinician’s differential diagnosis. 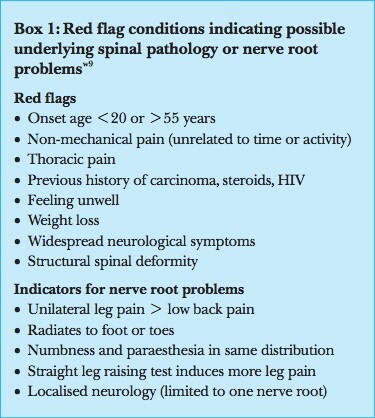 In clinical practice, the triage is focused on identification of “red flags” (see box 1/2) as indicators of possible underlying pathology, including nerve root problems. When red flags are not present, the patient is considered as having non-specific low back pain. Besides those red flags there are yellow flags. Besides the red flags we have to take another kind of flags in consideration, “Yellow flags” have been developed for the identification of patients at risk of chronic pain and disability. A screening instrument based on these yellow flags has been validated for use in clinical practice . The predictive value of the yellow flags and the screening instrument need to be further evaluated in clinical practice and research. Abnormalities in x-ray and magnetic resonance imaging and the occurrence of non-specific low back pain seem not to be strongly associated . Abnormalities found when imaging people without back pain are just as prevalent as those found in patients with back pain. Van Tulder and Roland reported radiological abnormalities varying from 40% to 50% for degeneration and spondylosis in people without low back pain. They said that radiologists should include this epidemiological data when reporting the findings of a radiological investigation. Many people with low back pain show no abnormalities. In clinical guidelines these findings have led to the recommendation to be restrictive in referral for imaging in patients with non-specific low back pain. Only in cases with red flag conditions might imaging be indicated. Jarvik et al showed that computed tomography and magnetic resonance imaging are equally accurate for diagnosing lumbar disc herniation and stenosis—both conditions that can easily be separated from non-specific low back pain by the appearance of red flags. Magnetic resonance imaging is probably more accurate than other types of imaging for diagnosing infections and malignancies , but the prevalence of these specific pathologies is low. The following list contains commonly used low back pain outcome measures. But these questionnaires are complete and not patient specific. Often medical imaging has to be done to include specific low back pain disorders but your own clinical judgment will be necessary to determine the most useful measure in your clinical setting. We found that the ‘Back Illness Pain and Disability 9-item Scale, Quebec Back Pain Disability Index and Roland & Morris Disability Questionnaire’ had a goodfactor of reliability. Is a condition–specific questionnaire developed to measure the level of functional disability for patients with low back pain. Intended for those who suffer diseases such as acute LBP, chronic pain, lumbar spinal stenosis, posterior surgical decompression. Patient-completed questionnaire which gives a subjective percentage of level of function (disability) in activities of daily living in those rehabilitation from low back pain. In acute or chronic low back pain. The patient is asked to tick off different statements when it is applied to him, that specific time. It is most sensitive for patients with mild to moderate disability. Is a self-report measure that evaluates functional ability that is intended for people who are suffering from back pain. It consists of 12 items. 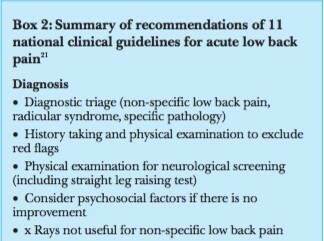 The first aim of the physiotherapy examination for a patient presenting with back pain is to classify the patient according to the diagnostic triage recommended in international back pain guidelines. Serious and specific causes of back pain with neurological deficits are rare but it is important to screen for these conditions. Serious conditions account for 1-2% of people presenting with low back pain. When serious and specific causes of low back pain have been ruled out individuals are said to have non-specific (or simple or mechanical) back pain. How does the patient enter the room? A posture deformity in flexion or a deformity with a lateral pelvic tilt, possibly a slight limp, may be seen. How does the patient sit down and how comfortably/ uncomfortably does he or she sit? How does the patient get up from the chair? A patient with low back pain may splint the spine in order to avoid painful movements. Strength testing of the lumbar spine includes the muscles around the spine column and the large moving muscles that attach onto the axial skeleton. The goal of muscle testing is to evaluate for strength and reproduction of pain. The straight leg raise test is used to evaluate for lumbar nerve root impingement or irritation. This is a passive test in which each leg is examined individually. The Slump test is used to evaluate for lumbar nerve root impingement or irritation. A positive Slump test result is demonstrated with the reproduction of radicular symptoms. The test is then repeated on the contralateral side. The femoral nerve traction test is used to evaluate for pathology of the femoral nerve or nerve routes coming out of the third and fourth lumbar segments. The one leg stand test, or stork stand test, is used to evaluate for pars interarticularis stress fracture (spondylolysis). The flexion abduction external rotation (FABER) test is used to evaluate for pathology of the sacroiliac joint. This test is used to determine if the hip is the source of the patient's symptoms. A positive test is a reproduction of the patient's worst pain that they came with into the clinic. In the next following text, we’ve listed all pathologies that we can define as specific low back pain. This gives a clear view of the pathologies and their specific medical management. Initially resting and avoiding movements like lifting, bending and sports. Analgesics and NSAIDs reduce musculoskeletal pain and have an anti-inflammatory effect on nerve root and joint irritation. Epidural steroid injections can be used to relieve low back pain, lower extremity pain related to radiculopathy and neurogenic claudication. The treatment of Scheuermann’s Disease depends on the patient’s age, degree of angulation, and estimated remaining growth. If the thoracic kyphosis exceeds 40-45° during the growth period and if there are radiological sings of Scheuermann’s disease, non-operative treatment is indicated. This consists of bracing, casting and exercises. (LE 2A). Spondylolisthesis should be treated first with conservative therapy, which includes physical therapy, rest, medication and braces (LoE: 3A) (LoE 2B). Non-operative treatment should be the initial course of action in most cases of degenerative spondylolisthesis and symptomatic isthmic spondylolisthesis, with or without neurologic symptoms (LoE: 3A) (LoE 2B). Children or young adults with a high-grade dysplastic or isthmic spondylolisthesis or adults with any type of spondylolisthesis, who do not respond to non-operative care, should consider surgery. Traumatic spondylolisthesis can be treated successfully using conservative methods, but most authors suggested it would result in posttraumatic translational instability or chronic low back pain (LoE: 3A). Exercises should be done on a daily basis (LoE: 2B). Physical therapy and bracing are used to treat milder forms of scoliosis to maintain cosmetic and avoid surgery (LoE: 1A). Scoliosis is not just a lateral curvature of the spine, it’s a three-dimensional condition. To manage scoliosis, we need to work in three planes: the sagittal, frontal and transverse. Different methods have already been studied  (LoE: 5). The conservative therapy consists of: physical exercises, bracing, manipulation, electrical stimulation and insoles. There is still discussion about the fact that conservative therapy is effective or not. Some therapists follow the ‘wait and see’ method. This means that at one moment; the Cobb degree threshold will be achieved. Then, the only possibility is a spinal surgery  (LoE: 1A). The more treatable condition of lumbar radiculopathy, however, arises when extruded disc material contacts, or exerts pressure, on the thecal sac or lumbar nerve roots  (LOE 1A). The literature support conservative management and surgical intervention as viable options for the treatment of radiculopathy caused by lumbar disc herniation. In the first place a conservative management is chosen. In a recent systematic review was found that a conservative treatment does not always provide for the disappearance of the symptoms of the patient  (LOE 1A). Providing information to the patient about the causes and prognosis can be a logical step in the management of lumbosacral radiculopathy, but there are no randomized, controlled studies  (LOE 1A). The ultimate goals of physical management are to ensure maximum neurological recovery and independence, a pain-free and flexible spine, maintenance of mobility and strength in lower limbs, of core strength, improvement of standing and walking function, improvement of bladder, bowel and sexual function, improvement of endurance and safe functioning of the various systems of the body with minimal or no inconvenience to patients and prevention or minimization of complications  (LoE: 1A). It is equally important for patients to regain assertiveness, take control of their own lives, and return to activities of their choice. The importance of on-going support to maintain health and independence following discharge should be strongly emphasized  (LoE:1A)  (LoE:3A). Treatment of Scheuermann's disease depends on the severity or the progression of the disease, the presence or absence of pain and the age of the patient. Patients with a mild form are suggested to exercise and get a prescription from the doctor for physiotherapy. The methods of physical therapy include exercise programs to maintain flexibility of the back, correct lumbar lordosis, and strengthen the extensors of the back, electrostimulation and vertebral traction for increasing flexibility before a cast is applied. Although physical therapy has no role in correcting the underlying deformity  (LoE: 2B). Physical therapy is recommended in combination with bracing  (LoE: 2B). Lumbar spinal stenosis (LSS) patients frequently receive early surgical treatment, although conservative treatment can be a viable option. Not only because of the complications that can arise from surgery, but also because mild symptoms of radicular pain often can be lightened with physical therapy  (LoE 2B). However, in patients with severe LSS, surgery overall seems to be a better option than conservative interventions such as injections and rehabilitation. Still, its specific content and effectiveness relative to other nonsurgical strategies has not been clarified yet  (LoE 1A). Postoperative care after spinal surgery is variable, with major differences reported between surgeons in the type and intensity of rehabilitation provided and in restrictions imposed and advice offered to participants. Postoperative management may include education, rehabilitation, exercise, behavioral graded training, neuromuscular training and stabilization training  (LoE 1A). Numerous physical therapy interventions have been recommended for patients with lumbar spinal stenosis, suggesting a role for general conditioning using body weight–supported treadmill walking or stationary cycling, strengthening exercises for the trunk and lower extremities, and manual therapy for the spine and hips  (LoE 1A). We must screen for these serious pathologies and specific conditions that lead to neurological deficit in the assessment of an individual with low back pain to direct appropriate management. Physical therapy has a beneficial effect in the treatment of specific low back pain, when it’s part of a treatment program. Goals of the rehabilitation, nonoperative and postoperative, are reducing pain and muscle tension, strengthen the stabilizing muscles and regain proprioception, neurological recovery and movement automatism. Physical therapy consists of passive and active mobilization and strengthening exercises. 90% of people will have no clear pathoanatomical diagnosis and an absence of red flags, these people have non-specific LBP. 7. Ristolainen et al. Untreated Scheuermann’s disease: a 37-year follow-up study, European Spine Journal. May 2012,21(5):819–824. 18. University of Michigan Comprehensive Cancer Center. Bone Metastases SymptomsLinton SJ, Hallden K. Can we screen for problematic back pain? A screening questionnaire for predicting outcome in acute and subacute back pain. Clin J Pain 1998;14:209-15. 19. Van Tulder MW, Assendelft WJ, Koes BW, Bouter LM. Spinal radiographic findings and nonspecific low back pain. A systematic review of observational studies. Spine 1997;22:427-34. 21. Linton SJ, Hallden K. Can we screen for problematic back pain? A screening questionnaire for predicting outcome in acute and subacute back pain. Clin J Pain 1998;14:209-15. 22. Van Tulder MW, Assendelft WJ, Koes BW, Bouter LM. Spinal radiographic findings and nonspecific low back pain. A systematic review of observational studies. Spine 1997;22:427-34. 23. Roland M, van Tulder M. Should radiologists change the way they report plain radiography of the spine? Lancet 1998;352:348-9. 24. Jarvik JG, Deyo RA. Diagnostic evaluation of low back pain with emphasis on imaging. Ann Int Med 2002;137:586-97.